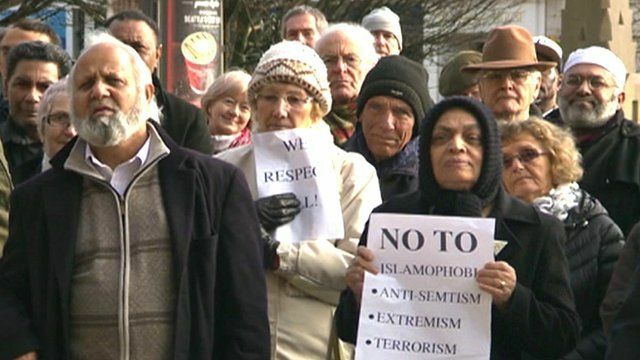 Birmingham rally after Fox comment Jump to media player A multi-faith rally partly prompted by a US TV pundit who claimed Birmingham was a "no-go zone" for non-Muslims has been held in the city. Fox news expert: 'I deserve what I got' Jump to media player An American terrorism commentator has apologised for getting his facts wrong about Birmingham during a Fox News interview. 'Brutal' backlash to Fox News pundit Jump to media player A US terrorism commentator has described the backlash against his comments about Birmingham as "brutal" but said he "deserved what he got". Fox News remarks 'a terrible error' Jump to media player American terrorism commentator Steven Emerson has told the BBC he made an "inexcusable error" describing Birmingham as a "Muslim-only city". Citizen Khan on 'Muslim Birmingham' Jump to media player The Birmingham-born creator of BBC comedy Citizen Khan criticises an American terrorism commentator who said the city was a no-go area for non-Muslims. A multi-faith rally partly prompted by a US TV pundit who claimed Birmingham was a "no-go zone" for non-Muslims has been held in the city. The gathering of more than 200 people outside the council house was also a show of unity in the wake of the recent Paris terror attacks, organisers said.